Two-thirds of Asia’s glaciers could survive to the end of the century if countries can limit average global warming to 1.5°C, according to a new study in the journal Nature. Even if all greenhouse gas emissions were stopped today, 14% of the continent’s “iconic snowy landscape” would be lost by 2100, Carbon Brief reports. With no effort at all to curtail emissions, two-thirds of the glaciers’ expanse could be gone by that time. The range of possible futures will make a decisive difference for the 800 million people in Asia who depend on the glaciers for drinking water. 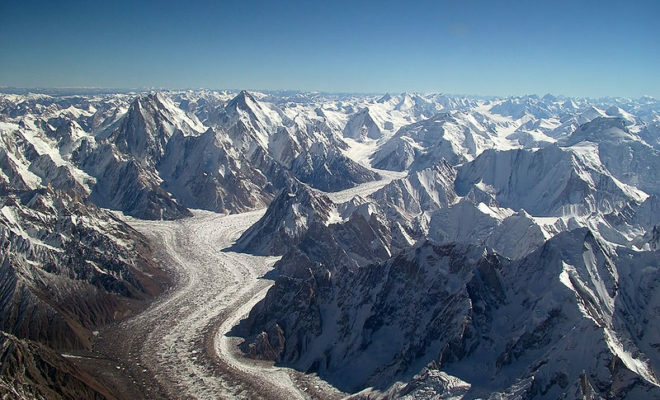 “The thousands of glaciers that are strung across the high mountains of Asia contain the largest store of permanent ice and permafrost outside of the North and South poles,” Carbon Brief explains. But “despite its snowy exterior, the mountainous region is expected to warm up at a faster pace than the surrounding low-lying land as global temperatures rise,” partly because the snow reflects more solar radiation back into the atmosphere than the darker earth beneath. The research team modelled glacier mass and melt under three different scenarios for future global warming, then compared the results with ice levels observed between 1996 and 2015. The more extreme the outcome, the more severely glacier loss will affect people in China, India, Nepal, Russia, and Kazakhstan. Under the two more optimistic scenarios, Kraaijenbrink said, “peak meltwater” could occur as early as 2030. “Glaciers store water in cold, often wet times of the year and release it during warm summer months when other sources of stream flow may be in short supply. This augmented supply of water, through glacier storage and runoff, can be critical when other sources are absent,” explained NASA scientist Dr. Alex Gardner, who was not involved in the study.